A strong earthquake shook the Lake Tanganyika region in Africa Monday, followed by two small aftershocks overnight. The magnitude-6.8 earthquake struck at 2:19 p.m. local time and was centered about 150 kilometers south of Kigoma, Tanzania, according to the U.S. Geological Survey (USGS). The star denotes the location of the earthquake that struck the Lake Tanganyika region of Africa Monday. The star's orange color represents a shallow depth of only 10 kilometers belowground. Image courtesy of the U.S. Geological Survey. The earthquake resulted in at least three deaths, a Congo official said in a Dec. 6 Associated Press report, and a U.N. official announced that the death toll could continue to rise as reports of casualties and damages slowly come in. Hard hit in the event were poorly constructed houses in Kalemie, in the eastern Democratic Republic of Congo, which collapsed and buried several children, and two small aftershocks overnight may have caused additional houses to collapse. The earthquake occurred at a shallow depth of 10 kilometers and originated from a fault in the East African Rift Zone, which runs north to south for about 3,000 kilometers, from Ethiopia to Zambezi. This zone, "is one of the most seismically active parts of Africa," says David Applegate, senior science advisor for earthquake and geologic hazards for USGS. The rift is an unusual occurrence in which forces pulling apart the continental plate could potentially split East Africa from the rest of the continent, according to USGS. The crust at the rift is stretching beyond its limits causing tension cracks, and magma rising through these cracks can be a source of additional pressure. 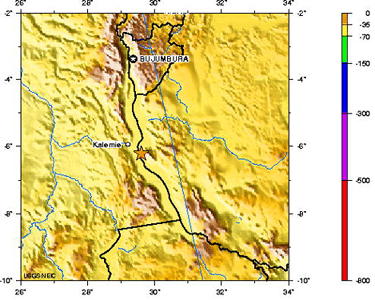 Historically, the region has given rise to numerous earthquakes, including a magnitude-5.5 earthquake in May 2002. That event shook the Lake Victoria, Tanzania, region, killing two people and leaving more than 400 families homeless. Associated Press report on CNN.com, Dec. 6, 2005.